John Hillcoat’s newest film, Triple 9 is a tense corrupt cop, crime thriller, with a star lineup that’s hard to rival. Sure, the plot is shakier than the camerawork on Cloverfield, packed with genre clichés, predictable plot points, and one of Kate Winslet’s most questionable performances ever, and maybe Hillcoat’s nihilistic commentary on the disintegration of trust, the pervasiveness of violence and America’s disenchantment is flat. But, put all that to one side and Triple 9 is a slick, rip-roaring ride replete with heists, gangsters, and bloody gun battles. Set in Atlanta Georgia, a mixture of corrupt cops and ex-military men rob banks at the behest of the Russian mob leader Irina Vlaslov (Kate Winslet). After completing what they think is their final heist, they are forced into making one last robbery. In order to distract the Atlanta police force long enough to allow them enough time to carry out their plan, they decide to put out a Triple 9 distress call – which translates to officer down. Action ensues. Fundamentally, Triple 9 is a B-movie with style and a budget and more A-list actors than you can shake a stick at. Where it loses itself in plot and performance (Woody Harrleson teeters on the edge of parody) it finds itself in its visuals and thrills. Hillcoat does an excellent job of drenching this film in atmosphere, its dark, moody with an underlying seediness, and he pairs this brilliantly with stunning action and set pieces – the film’s opening bank robbery, officer Chris Allen’s (Casey Affleck) room by room clearing of a flat – that are both great to watch and tense. This is an adrenaline pumped, thriller, take it on the face of that and you’re in for a great time. 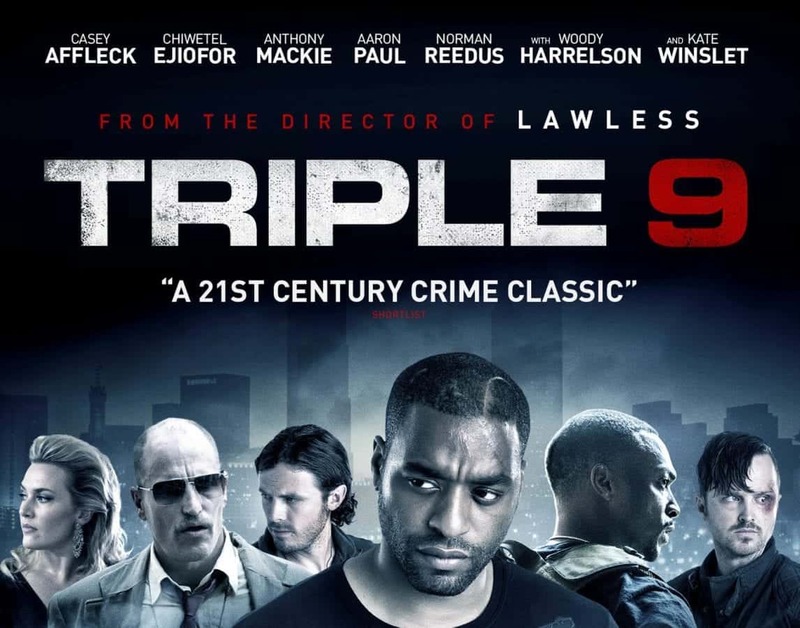 Triple 9 is out on DVD on 27th June.